Beautiful carvings – but my biggest impression is that Hinduism is a religion of peace in a way I had never realised before. 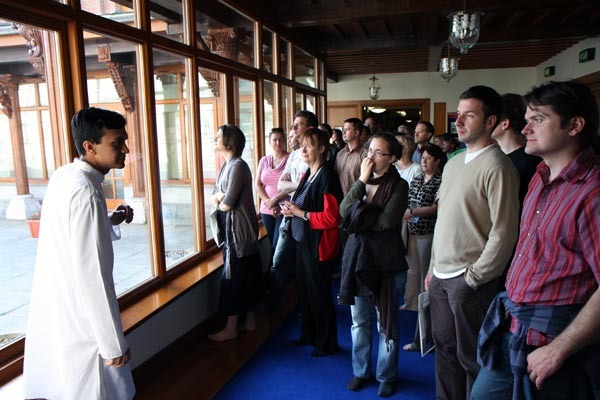 These were the words penned by just one of the hundreds of visitors who came to the BAPS Shri Swaminarayan Mandir in Neasden, London, as it featured again as a part of Open House London. 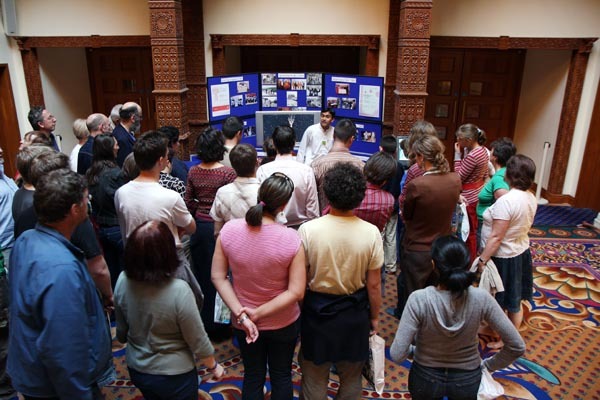 This year the annual event took place during the weekend of 21 and 22 September 2008. Open House is a unique, independent organisation committed to raising the standard for London’s architecture and built environment by opening people’s eyes and minds to design – through debate, dialogue, learning and direct experience of excellent spaces and places. Specifically, Open House London is London’s “largest architectural showcase” and this year’s event revealed the fabric of London in all its diversity: opening eyes and minds to the architectural gems, contemporary design and areas of urban change that define the city today. 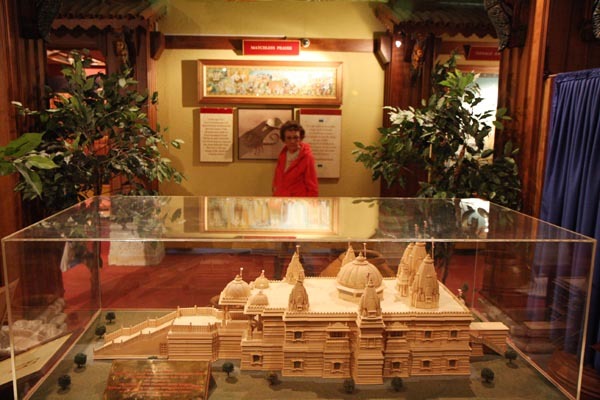 The Mandir, recently acclaimed by Time Out city guides as “one of London’s Seven Wonders”, is a traditional favourite among architecture buffs who take advantage of this regular showcase. And this year was no different. As the September skies opened up to leave the Mandir gleaming in glorious sunshine, visitors steadily poured in from 10am to 4pm. 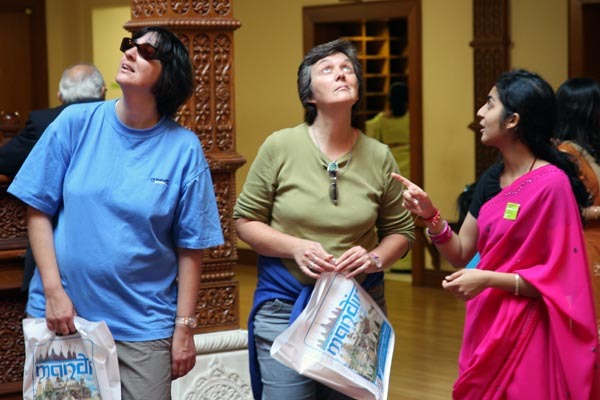 Individuals were free to absorb the atmosphere as they wished and many chose to take the personal audio-guided tours. 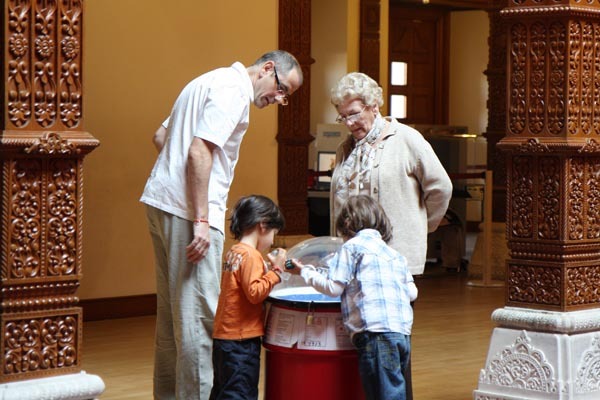 For larger groups, trained volunteers were on hand for special guided tours at scheduled intervals. 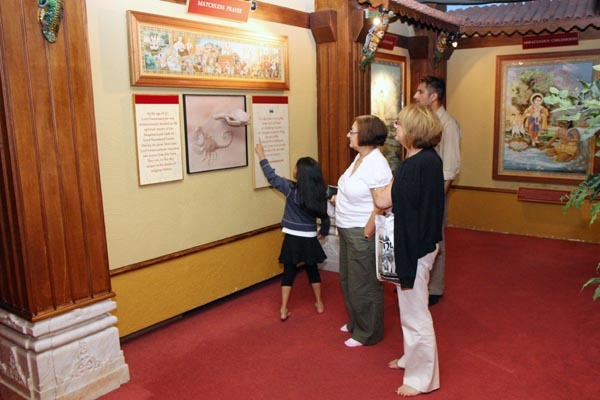 This included a chance to view the grand Haveli Prayer Hall and also a visit to the ‘Understanding Hinduism’ exhibition – all free of charge. 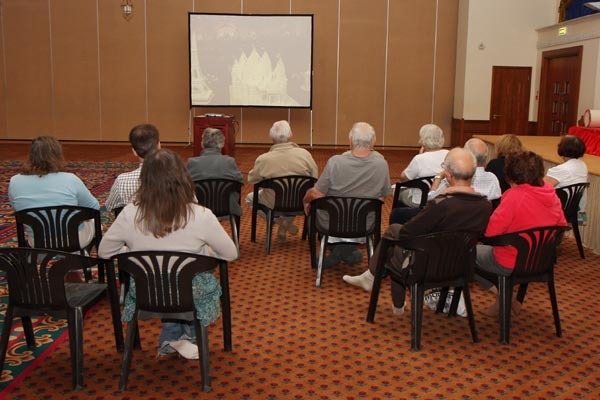 Visitors were also given the option to see a short documentary on the making of the Mandir, and were given a special DVD with other video presentations. Many even attended the midday arti ceremony. Some 700 beautiful buildings were ‘on show’ across the historic city of London. 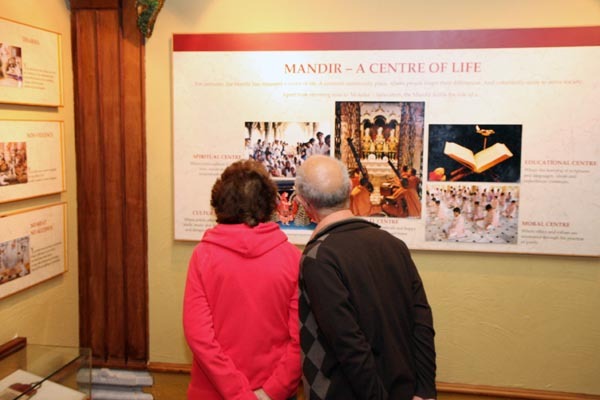 Almost 1,400 visitors chose to explore and enjoy the beauty and serenity of the Mandir over the sunny weekend. Wonderful. Very peaceful and beautiful. Taking part in prayers was unbelievable. Did not wish to leave your lovely building. The Mandir is a wonderful place. The experience is marvellous. It has been the best organised Open House event I have attended. I will recommend it. Humbling. Most beautiful. Impressive in its prayerful and peace-inducing qualities. Thanks to the many people who greeted and looked after us, my wife and I, during our visit. Fascinating and interesting place. Beautiful building. Informative exhibition. A most worthwhile visit. We were greeted and guided with great politeness and consideration. The time spent with us was much appreciated. Welcoming and informative. The atmosphere of silence was moving and a deep experience to see so many in sincere and perfect prayer. Thank you for great hospitality. I found my visit to be peaceful & spiritual – a reminder why we are here on Earth & how far modern life has taken us away from our reason of existence, whatever one’s religion. A place built with devotion, cared for and visited by people with devotion. It is a pleasure to visit and I would very much like to learn more and come here again on my spiritual path. Please do contact me again if you wish. Absolutely Fantastic! A very beautiful building, so proudly shown by staff who made us feel very very welcome! We really enjoyed our visit and plan to bring other family members. Many thanks! A very beautiful place. 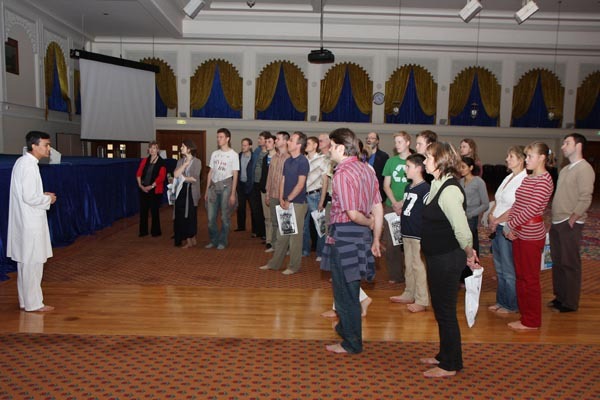 The introduction to Hinduism is very useful information to understand the beauty and culture of this place and to understand the Hindu community in London. Great experience! Fantastic. An absolutely beautiful building – very interesting to learn about its construction. I was overwhelmed by everyone’s friendliness + openness. Was really pleased to be encouraged to stay for the ceremony. Inspirational architecture and craftsmanship. A gift for London. I was in a really bad mood when I got here because of all the tube and bus closures. Then as soon as I walked in the Temple I instantly forgot all those stresses and felt so peaceful. An extremely peaceful and very vibrant place that whilst attending the exhibition gave me a tremendous feeling of rightness that, at one point, even reduced me to tears!